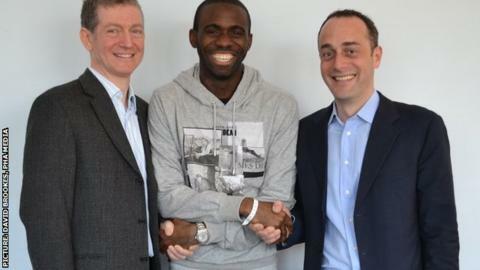 Bolton midfielder Fabrice Muamba has paid tribute to the London Chest Hospital staff after being discharged. The 24-year-old was technically "dead" for 78 minutes after suffering a cardiac arrest and collapsing in a game against Tottenham on 17 March and had been in hospital since then. "I am naturally very pleased to be discharged from hospital," he said. "I would like to take this opportunity to pay tribute to every single member of staff who played a part in my care." "It's remarkable when you consider that his heart stopped beating for 78 minutes. "I understand that he had a relatively minor procedure to be fitted with a defibrillator, a pacemaker, because of the risk that he can suffer a cardiac arrest again in the future. "There's a long way to go in terms of recovering fully. We don't know what the defibrillator means for his playing career." Muamba, pictured with Dr Andrew Deaner and Dr Sam Mohiddin of the Barts Health NHS Trust on his discharge, said: "Their dedication, professionalism and expertise is simply amazing and I will forever be in their debt. I also wish to say thank you to all the many well-wishers who have sent thousands of messages of support." And in a joint press release issued by the Trust and his club, the midfielder continued: "Now I am out of hospital, I am looking forward to continuing my recovery and spending precious time with my family." Bolton Wanderers manager Owen Coyle said: "It is absolutely fantastic news that Fabrice has been discharged from hospital and everyone at the club is delighted. "We would also like to add our thanks to the staff at The London Chest Hospital for their care and treatment of Fabrice, which has been outstanding. "It is important that Fabrice and his family are now given time and space to be together, and we would ask the media to continue to respect their privacy." A spokesman for the Trust said: "Barts Health can confirm that Fabrice Muamba has now been discharged following several weeks of treatment. All our staff wish him the very best in his ongoing recovery." Muamba collapsed after 41 minutes of the FA Cup quarter-final tie with Spurs and was given mouth-to-mouth resuscitation and 15 defibrillator shocks before he arrived at the intensive care unit of the heart attack centre at the London Chest Hospital. The former England Under-21 international was helped on the pitch by Deaner, consultant cardiologist at London Chest Hospital, who was at the game as a fan, and ran out of the stands to lend his expertise. Last month, Trotters club doctor Jonathan Tobin said: "It was 48 minutes when he collapsed to reaching hospital and a further 30 minutes after that. He was, in effect, dead at that time. "We were fearing the worst and didn't think we would get the recovery we had. It's incredible."